LOOKING FOR INFORMATION ON HURRICANES? CDC's Emergency Partners newsletter will continue to send out Special Edition 2017 Hurricanes with updates. Check CDC's Hurricanes and Other Tropical Storms site for resources and information. To see previous newsletters, see our archives. Information about migrant health centers in your area is just a click away. There are 48 million Americans who have significant hearing loss. The ScoutStrong initiative of the Boy Scouts of America (BSA) integrates active lifestyles, healthy eating, and emotional fitness into everything BSA does. 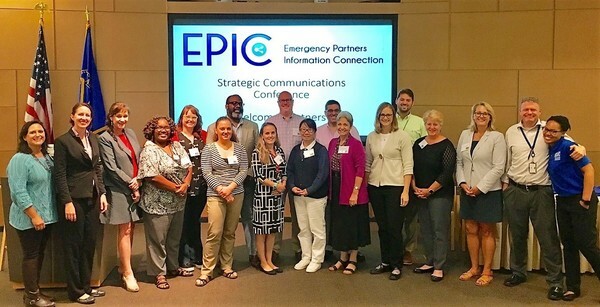 As a fitting start to National Preparedness Month, a diverse roster of disaster relief and community service organizations convened at CDC to participate in the Emergency Partners Information Connection (EPIC) Zika Strategic Communications Conference September 7-8. An inaugural event for the EPIC team, this exciting opportunity was a meeting of the minds among leaders from some of the nation’s most influential non-profit and community-based organizations specializing in emergency response. Although several organizations had to cancel due to their participation in responses to hurricanes Harvey and Irma, a total of 15 leaders representing 14 partner organizations participated in the two-day meeting. The goal of this meeting was to increase the capacity of EPIC’s partners to provide resources and information to vulnerable populations during emergency situations. The EPIC stakeholder meeting provided partner organizations with insight about the team’s operational focus within an emergency response, while also providing an overview of how they function within CDC’s Office of Public Health Preparedness and Response’s Division of Emergency Operations, the Emergency Operations Center and the Joint Information Center (JIC). Attendees shared information about their organization’s disaster and emergency relief operations and the communication efforts that form an integral part of these operations. They learned from each other while engaging in a lively exchange about how to disseminate emergency messages and resources to at-risk populations. The EPIC team looks forward to using the information shared during the meeting to develop new offerings and training opportunities for its partners, as well as continuing to build new relationships with even more organizations across the United States. Disease outbreak response and prevention requires more than just science. A successful health intervention needs to be led by who we are caring for. Understanding culture—what makes a population unique, how they understand illness, and how they live—is critical to stopping disease spread. The Navajo people (Diné) have lived in the Four Corners area, covering parts of Arizona, New Mexico, and Utah, since long before U.S. colonization. According to Navajo culture, the Diné arrived on Navajoland by emerging through four levels of worlds, and they live as they were taught, in a tradition that maintains balance and harmony with Mother Earth, Father Sky, and the elements of life such as people, animals, plants, and insects. Some Diné people who practice traditional religion live in the Hogan, or “sacred dwelling,” to conduct traditional healing ceremonies for mental, spiritual, and physical wellbeing. Each Hogan has an opening on the east side to bring in harmony of the sun, a conical roof for harmony with the sky, and walls and floor made of branches, bark, grass, and earth. After the Hogan is constructed, the Medicine man blesses the house. But this way of life, maintaining such closeness to earth, may increase the risk of hantavirus, a disease carried in rodents that live in the area. Navajo Nation’s Department of Health, with the help of CDC, has found some ways to address this risk communication challenge. In 1993, a mysterious deadly illness causing respiratory issues was spreading in Navajoland. Local reporters began calling the unidentified illness “Navajo Disease.” Worse still, reporters and disease investigators overwhelmed the people, often without invitation, and in ways disrespectful to Navajo culture. The outbreak investigation concluded that the illnesses were caused by a newly identified type of hantavirus, Sin Nombre hantavirus (SNV). Then, two years ago, another person died of hantavirus, and three others became ill on Navajoland, bringing back the memories of stigma and fear. Del Yazzie, the Acting Director of Navajo Nation’s Tribal Epidemiology Center, reached out to CDC’s hantavirus experts and told them that the greatest need was to educate the Diné about this disease and its prevention in the Navajo language. It was important to make people aware of the symptoms and how to prevent mice from getting into their homes. 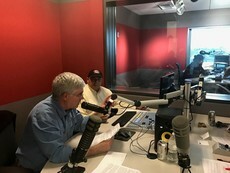 Above left: Craig Manning and Del Yazzie recording a radio show. Less than a week later, Craig Manning, a CDC Health Communication Specialist, was at the Tribal Epidemiology Center in Window Rock, Arizona, working with Yazzie and his team to develop messages and a community education plan. When Manning first met with Navajo Department of Health officials, they told him that the best way to reach the most people was through radio. From families at home to sheepherders in mountains, many Navajo Nation community members get their news from radio. Yazzie and Manning approached KTNN, a radio station heard across the Nation, to create Public Service Announcements (PSAs), and a live, call-in program on hantavirus. Experts from Navajo Nation and CDC, as well as Navajo Nation President Russell Begaye and Vice President Jonathan Nez, brought together public health science and prevention information spoken in Navajo through revered trusted officials on the first call-in radio talk show in 2016. More recently the medicine man of the Navajo Department of Health worked with Yazzie and Manning to record a PSA giving guidance on prevention, transmission, symptoms, and treatment of hantavirus. A medicine man is “the holder of truth” about the Navajo way of life and is considered a superior being; a healer, religious leader, and historian able to reach out to spiritual Gods through chants to bring people back into balance, especially when they are ill. 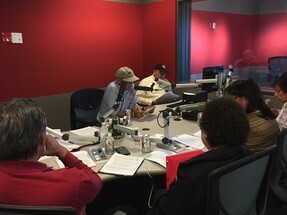 Above right: Craig Manning interviewing Del Yazzie for a radio show. While these PSAs played two times per day for a month, Yazzie received many positive follow-up calls and emails and questions from listeners showing that people were now aware and interested in learning how to prevent hantavirus. This partnership resulted in a new way to reach out to the Diné with health information and established a system to reach the most people quickly in an emergency. Navajo Nation’s Diné College invites Manning to return each spring to teach students in the Principles of Public Health course how to develop video PSAs. When fighting a disease outbreak, it’s important not to lose sight of the goal: to protect the people at risk. Understanding the culture and people affected by an outbreak is just as important as understanding the disease behind it. Identifying hantavirus as the cause of the rash of illnesses and deaths in the 1990’s without fully understanding and working with the local population only addressed part of the problem. With Diné national and spiritual leaders determining the best ways to reach their communities, more people in Navajo Nation have the information they need to protect their health.